Whether you are a beginner fisherman or you are struggling to get started, fishing can be one of the most enjoyable engagements. However, there are some essential things that you must have to get started. If your friends have invited you out or you are just curious to get started on your own, here are the top 6 fishing essentials for beginners. Although there are several other ways of fishing, if you are interested in a classic method of fishing then you need to have a rod and reel. While there are very expensive, high-quality rods and reels available, you can start out with a sturdy basic rod attached to the reel. As a beginner, your rod should be of medium strength to angle different kinds of fish. While your fishing rod may come with a line and hooks, you might still require some backups. The most common type is a monofilament which is an all-purpose fishing line that you can use anywhere. When it comes to fishing hooks, you need to choose a simple and basic product that you can use. Remember, without a hook; you might not be able to catch anything. If you want to bank fish, having a small tackle box is much better than hauling around a bigger one. A tackle box that can fit into the backpack is just ideal for fishing. According to experts, the right fishing technique usually depends on the kind of fish that you want to catch and the technique that you want to use. As a beginner, you need to start out with a versatile tackle that’s suitable for all fishing styles and all fish. 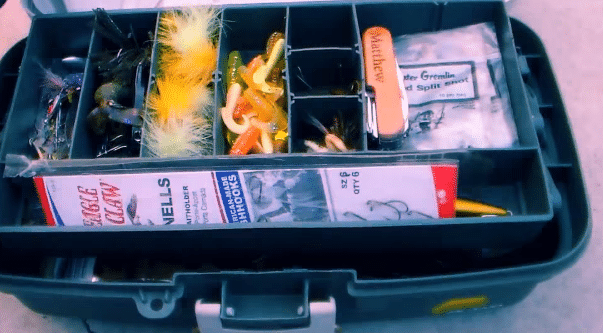 By having a good tackle box, you’ll get organized, prepare for an emergency, and fish anytime you want. Depending on where you want to fish, you need to get a fishing permit. Make sure you get a permit and spend few minutes reading through the rules that are relevant to the area where you want to fish in. For instance, it’s very important to know about the permitted fishing methods, the size and the bag limits, and the regulations affecting certain types of species. One of the biggest mistakes that new fishermen make is getting a very large bobber. Typically the smaller the bobber, the better your experience. You need to use bobber that will not only float your bait but will also pull down easily anytime a fish nibbles. If you want to do live to bate then having a bobber is very important. As compared to the traditional round plastic ones, the thin pencil type is usually much more sensitive. These are some of the things that you need as a beginner. However, as you improve your technique and progress, you can customize your own tackle and upgrade your technique as a pro. Once you have all these essentials, you will be catching fish within no time. With little patience, practice, and knowledge you will be on your way to becoming one of the best fishermen.